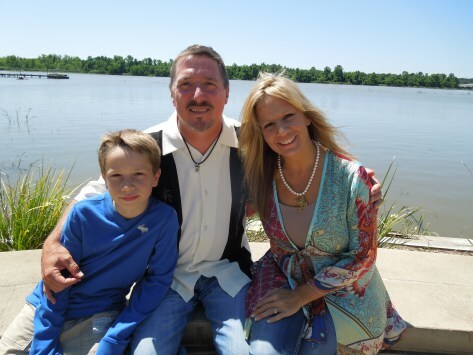 In September, 2011, then 47-year old Phil Baumann started experiencing severe headaches. Then he started getting into his car on the passenger side instead of the driver’s side. When he would talk on his cell phone, his arm would be stretched out to his side and not bent up to his ear. His family doctor thought it was a sinus problem that was causing the headaches and the odd behavior, but after a trip to the emergency room, he found out he had a large tumor on his brain. After an MRI, he found out it was malignant. Glioblastoma Multiforme Grade 4, one of the worst forms of brain cancer, was the diagnosis. This type of cancer is particularly damaging because it’s relentless. In other words, once surgeons remove the tumor, it keeps coming back. This is what happened to Phil. Surgeons at M.D. Anderson Cancer Center in Houston took out his tumor and six months later it reared its ugly head again. But luckily, it came back in an area of the brain right above where the tumor was and this gave doctors a chance to treat it. Instead of opting for another surgery, he entered the Delta 24 clinical trial. The trial involves injecting a modified cold virus directly into the tumor. Since entering the trial in April 2012, Phil has seen his tumor shrink every 8 weeks to the point where it is now non-existent. Of the 29 people in the trial, only two others had the same outcome. Baumann feels more than blessed. Most people who deal with a disease as devastating as this one would be happy to receive good news and move on with their lives. However, you have never met Phil and his wife, Misty. In 2012, they put on the first Curefest at the Humble Civic Center in Humble, TX, just north of Houston. The event raised more than $150,000 and helped fund nine patients in the Delta 24 trial at M.D. Anderson. The money raised at Curefest 2015 will go towards a new phase of the trial that is looking at the effectiveness of injecting stem cells directly into the bone marrow, and sparing patients the pain of a needle in the skull every 8 weeks. This year’s event will feature games and activities for the kids, a silent auction, and a live auction. A slew of local bands will start at 11 a.m. with American Idol top 10 finalist, Sundance Head, headlining the 12-hour event. My band, The Crashers, played Curefest 2013 and it was amazing to see how the community came together for this event. Friends, family and strangers from all walks of life donated time and treasures to help this family make a difference in the lives of people who are searching for a miracle. Like the song says…”take a sad song and make it better.” The Baumanns are doing just that. What: Curefest 2015, featuring American Idol top 10 finalist, Sundance Head. When: 11 a.m. – 11 p.m.